i love these few weeks before christmas when every day my mailbox seems to have a surprise for me! i've been receiving christmas cards from friends and family, and i just love snipping open the envelope to reveal something joyful inside (i always snip, never rip). below i am going to natter on about how i feel about christmas cards. these are one hundred percent my opinions and describe the way in which i go about the yearly tradition. no inferences should be made as to how anyone else should do things. 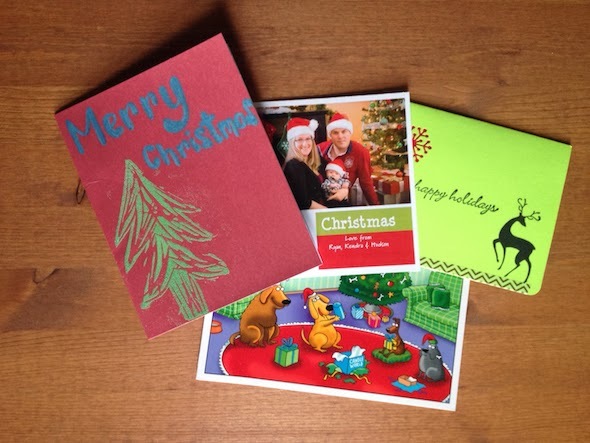 comparatively, not many people mail christmas cards to others anymore. to young people, the tradition feels antiquated, and technology makes sending a holiday hello or e-greeting that much easier. therefore, going the distance to actually send a physical piece of mail makes you seem like the coolest person in the world! (or so i like to imagine :). as with sending snail mail any other time of year, the sheer act of doing so makes it look like you've gone above and beyond. personally, i love to send christmas cards, as evidenced here, here and here. as with everything else i do, it's more about the process than the actual task or item itself. i put time aside, craft with friends, and draw up ideas of what my cards will look like. that way it remains full of enjoyment and doesn't become a chore. i don't really feel any sense of obligation when it comes to who i send christmas cards to. i don't think there needs to be any hurt feelings based on whether someone does or doesn't send/receive a greeting. this is probably easier to avoid nowadays since the act itself is rare. but honestly, i just send cards to people i've felt close to that year - and my list changes every christmas! there does seem to be a connection between marriage, and family that adds you to other's christmas card lists. which seems funny to me. when i send cards, i am still trying to train myself to address it to both parts of a couple. i don't know why but i have trouble remembering that even though the woman may have been my friend originally, her husband or partner is important too! though for anyone sending me mail - i can pass on the "mr. and mrs. jonathan webb" addressing. my husband is important...but i am too! i've taken to signing our own return address as "the patient webbs" - a fun play on our last names. the word "message" really speaks for itself here. maybe it's just me but i think that if i'm going to go through the effort of choosing or making a card, paying for postage and walking to the post office...i might as well take the time to write a couple sentences before i sign my name. i love getting cards but i must admit it's somewhat disappointing to open them up and not have anything to read besides the canned "season's greetings" message. whenever possible i try to personalize my message to the person i'm sending the card to. okay, this one might be up for debate. i really do believe that sending a card at all is awesome sauce. but some cards seem so generic that they barely hide the fact they were purchased at a bulk foods store half off the year before. they don't have any charm or pizazz or thought at all. i'm just saying i like when a card is beautiful, unique, handmade and even comes with a jazzy envelope! 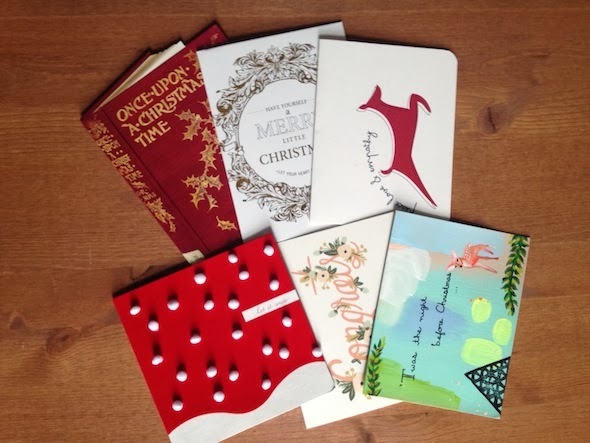 below are some of the cards i've received this year - and what a great lot indeed! "always snip, never rip" - I concur. HAHAHAHA - so many great cards!!! !